AMACS offers single source manufacturing capabilities to speed deliveries and enhance quality control. 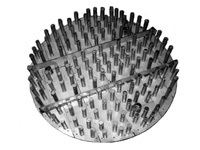 As a major manufacturer of profile wire screen products we build outlet collectors, catalyst bed supports and other profile wire components to customer specification from the bare wire. With a total fabrication capability, steel plate and alloy components such as distributers and mixing trays can be cut, welded and shaped to specification on site. Each stage of reactor internal manufacture is recorded and controlled by strict quality assurance guidelines. Complete engineering support enables customers to order to performance requirement. Customers can provide the process specifications and AMACS can engineer the mechanical requirements with components designed to clear manway openings during installation and maintain structural integrity in demanding process conditions.